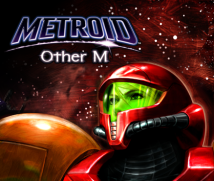 Well then, in review, I’d like to talk a little more about a recent example of a game with the “comic touch,” “TOMODACHI COLLECTION” (Friend Collection) and an epic “serious touch” game, “METROID: Other M,” both games which I produced. Let’s start with “Friend Collection”- as I mentioned earlier, this game is impossible to put into words in a short period of time, so I’d like to show you a video. Please take a look. 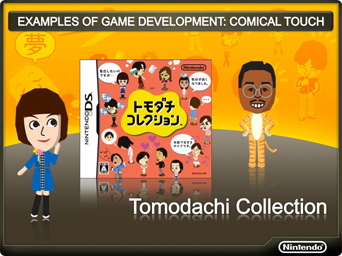 PLAY MOVIE: TOMODACHI COLLECTION VIDEO Were you able to grasp what Friend Collection is about? It’s hard to get a full understanding, but as long as you thought it looked fun, I’m happy. Friend Collection is software that lets you create Mii characters of your friends, family members, or anyone you like to play with in amusing situations.TOMOKORE was released in Japan in June of last year, but if I trace back its roots, I’d actually been holding on to the idea for this title for 9 years. In 2000, a game was released in Japan that paved the way for Friend Collection. It was geared toward young girls27 and was meant to help the player make friends and facilitate communication. We took the original game, which was based on the idea of fortune-telling, and added a few nasty twists, making it into a slightly darker title which we were calling, “the grown woman’s fortune-telling notebook.” However, due to a certain discovery, the project took a significant turn. 27 The game geared towards young girls was Tottoko Hamtaro Tomodachi Daisakusen Dechu, which was released for the Game Boy Color in September 2007 in Japan. Actually, the Mii Channel28 on Wii, which I’m sure you’re familiar with, was born from Friend Collection. One day a member of my staff showed me a montage of Mii prototypes. They functioned a lot like the current Mii characters, but you could only swap out the various face parts. I tried to make a character that looked like me but, of course, I couldn’t. 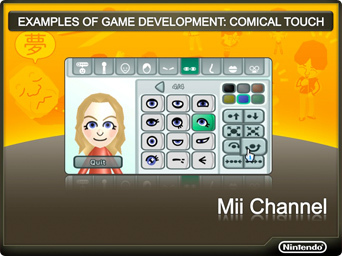 28 Mii Channel is a software title that comes pre-installed on Wii consoles. Players can combine face parts to easily create likenesses of their friends and family. “Why can’t I resize my face parts? Why can’t I change the angle or location of my eyes? Don’t you think that would make it look like me? Don’t you think I should be able to make someone with an atypical face like mine?” After I said these things, that staff member immediately revised the program. When I tried the new version, I was able to make my own face! On top of that, we were able to perfectly recreate the face of someone with an even stranger face than mine. Of course, in my usual fashion, I had to brag about this huge discovery to Mr. Iwata. And of course, Mr. Iwata was very happy. I was the winner. But, a few days into my celebration, Mr. Iwata contacted me and said, “Can we borrow those caricatures for Wii?” I was unable to hide my surprise but, of course, I agreed. Mr. Iwata also asked, “Can I borrow the team who created these caricatures?” and it was decided that those members of my staff would “study abroad” in a sense as members of Mr. Miyamoto’s team. About a year later, that team returned to me stronger than when they’d left, and we re-started the project. They learned a lot during their time away. The members who worked as a part of Mr. Miyamoto’s team had matured. And, of course, the “Mii editor” structure was complete. 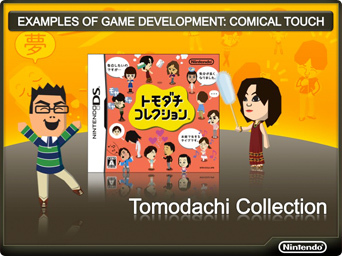 And the caricatures that we’d created, known as Mii characters, were spreading around the world. In all honesty, between the discovery of the Mii characters and the shift from “the grown woman’s fortune-telling notebook” to Friend Collection to the game’s completion, we faced many challenges. There really hadn’t been a game like it before, so we didn’t know where we were supposed to land. While it was being developed, I was away a lot on “Other M”-related business trips, so I bet the Director felt discouraged at times. During these business trips, after I got back to my hotel, I remember going back-and-forth on email with the director – deciding on features and at times stirring things up. In my role on this project as producer, I think my greatest contribution was working with the director to stay true to the Friend Collection vision we’d created, making decisions about what needed to be included in the game, and really choosing what we needed to be particular about. I was very happy to have a wide variety of unusual and rare material from my own mental archives to work with. So in this title, what examples can we find of “mood,” “timing,” “foreshadowing,” and “contrast”? I could show you some small examples from the software but in TOMOKORE, the story is driven by the player. Maybe some of you have already noticed, but the movie I showed earlier and the “communication genre” definitely show what I mean by this. With regard to this title, there are many more episodes I’d like to talk about, so please allow me to share just one of them with you. As a piece of advice, there was something I would say to the person responsible for the music in Friend Collection, “You need to take off your underwear.” Simply put, what I wanted from him was to “not hold back” or rather “to let himself out” – for me this phrase has many different nuances and meanings. Why am I bringing this hard-to-explain idea up now? Because Mr. Iwata was very amused by this episode as well. In other words, I wanted to tell you all that I won.